The buildup of greenhouse gases in the atmosphere is warming the oceans, and the waters off New England's coast are seeing some of the most dramatic temperature increases on the planet. This is having a major effect on lobster populations and the fishermen who rely on them. The southern New England lobster fishery has collapsed and the catch has moved north into cooler waters. LOBSTER WAR documents an escalating conflict between the United States and Canada over waters that both countries have claimed since the end of the Revolutionary War. The disputed 277 square miles of sea known as the Gray Zone--the swath of water surrounding Machias Seal Island at the entrance to the Bay of Fundy--were traditionally fished by US lobstermen. But as the Gulf of Maine has warmed lobsters have migrated north and the Gray Zone's previously modest lobster population has surged. As a result, Canadians have begun to assert their sovereignty in the area, contesting American claims to the bounty and foreshadowing potential conflicts exacerbated by climate change. Other films by David Abel and Andy Laub are Sacred Cod and Gladesmen: The Last of the Sawgrass Cowboys. "Engaging...Lobster War gives a personal window on the daily lives of the hard working fishermen and their families, on and off the water, and does so by balancing perspectives from both sides. By also weaving in the science behind the impacts of a warming climate, the documentary brings into focus the broader challenges facing coastal communities and their working waterfronts as they confront the uncertainties of a changing marine ecosystem." "Lobster War is important in bringing awareness to a significant conflict that remains unknown to many. This is a valuable educational tool on a broad range of important issues linking maritime border disputes and unresolved geopolitical tensions to the impacts of climate change on the marine environment and human coastal communities. For educators, this film is a succinct way to introduce and discuss the complexity of marine natural resource use, particularly in future climate scenarios." "Through the work and lives of fishing families and scientists, this film tells compelling stories about the impacts of climate change...It does so through its focus on conflicts that have escalated in a disputed border region between Canada and the US as well as the broader issue of the increasing vulnerability of lobsters, and the coastal economies dependent on them, in a rapidly changing world. The film can serve environmental science and marine biology classes but also find traction in courses concerned with international politics and marine governance and for coastal communities concerned about their futures." "This fair-minded yet charged and beautifully made film compels us to consider the dispute as symptomatic of the much larger struggle facing all of us: adapting to climate change, whether individually or nationally, economically, or socially. This is not a problem we can fix by drawing lines on a map, because we're all in the same boat." "Lobster War presents a complex argument from a variety of viewpoints, going well beyond the particulars of this one case to provide an overall perspective on the biological, economic, political, and sociocultural features of the Northeast lobster industry." "Lobster War tackles global issues from a tiny island in Maine...Emblematic of the coming conflicts caused by manmade global warming in miniature." "Beautiful...A compelling statement on the effects of climate change on fisheries." "Climate change, increased lobster populations and a centuries-old land dispute have created a perfect storm...[Lobster War] explores how this conflict came about and why it may only get worse as temperatures continue to rise across the world." "Lobster War provides a microcosm of the issues facing humanity in the next decade: climate change, dwindling resources, and international conflict. It is an important film for anybody who wants to understand the interplay between fisheries and climate change." 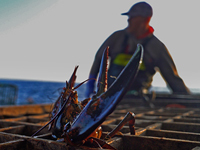 "Wonderful personal interviews...An in depth look at the lobster's journey from catch to table. This documentary does a beautiful job of encapsulating all of the issues at hand within the Machias Seal Island waters and what is personally at stake for all those involved." "Climate change, thriving lobster abundance, maritime boarder disputes - Lobster War tells compelling stories about how international conflicts have been created and why they may escalate in the future. This is an excellent educational tool on marine natural resource management, international policy, and marine economy." "A poignant portrayal of the high stakes that emerge when unresolved boundary disputes, the effects of global warming, and the deep grip of occupational tradition collide...By putting a human face on the lobster's ecological fate, Lobster War casts all of us as stakeholders in the crustacean's future, just as much as the American and Canadian families that rely on it for their livelihood." "Offers an ominous and timely preview of how a warming world threatens to undermine fishery management regimes and spark international tensions, not only between the United States and Canada, but around the world."